THE speech from the throne presents a clear path forward for a government that is working to make life better for people, said Premier John Horgan on Tuesday. Government is putting people first and making progress on the shared priorities outlined in the Confidence and Supply Agreement, negotiated with the BC Green Party caucus. To help people struggling to make ends meet, government is making life more affordable by eliminating Medical Services Plan premiums starting January 1, 2020. To help the 22 million passengers who travel on BC Ferries each year, government is freezing ferry fares on major routes and maintaining its discounts on minor and northern routes for the second consecutive year. To help more families find an affordable home in their community, government will address the recommendations of the Rental Housing Task Force, deliver more efficient project approvals and keep building housing for people. More than 17,000 homes are underway, including homes for students, Indigenous communities, women and children leaving domestic violence and affordable rentals for middle-income families. Tens of thousands of families are already enjoying the benefits of B.C.’s affordable child care program. To make sure more affordable child care is available to more families, government will set out to create new legislation that gives universal access to quality, affordable child care the force of law. As the Phase 1 review of BC Hydro nears completion, government will take steps to protect ratepayers and ensure proper oversight as the corporation provides affordable, clean and reliable power for generations to come. And government is undertaking the most significant reforms to car insurance in a generation, after the old government ignored the worsening situation at ICBC – leaving the Crown corporation with losses of more than $2 billion in the last two years. Government will continue to consider further measures to make sure that ICBC can deliver high-quality public auto insurance coverage at the lowest possible cost. To help people save money and crack down on unscrupulous business practices, government will set new rules for live-event ticket sales, take action on unfair payday loan practices, provide greater transparency in cellphone billing and advocate for more affordable options. To reduce climate pollution and create jobs and opportunities for people, government has released its CleanBC plan, which will reduce emissions and create an innovative, low-carbon economy. Government will bring forward measures for the implementation of CleanBC in Budget 2019. From action to protect wild salmon, renewal of B.C.’s coastal forest sector, innovation in agriculture and liquefied natural gas, government is strengthening B.C.’s traditional industries and making sure they are working for people. “We’re encouraging economic growth across sectors by investing in people and the infrastructure and services communities need. It’s part of delivering the strong, sustainable economy B.C. 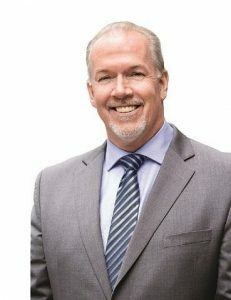 needs, now and into the future,” Horgan said. Building on the work that is underway to share gaming revenues, forge stronger partnerships and make sure First Nations are full participants in decisions affecting their rights and lands, B.C. will become the first province in Canada to legislate implementation of the UN Declaration on the Rights of Indigenous Peoples. “Making life better for people starts with the choices we make every day. Our government’s affordability initiatives have put more money back in people’s pockets. We are on the path to better health care for patients, quality care for seniors, better schools for our kids, more opportunities for young people, and good jobs with good wages in every region. “Today and every day, our government is going to keep working hard to make life better for people,” Horgan said.